Art, dance and culture were the focus of the first SO Festival in Skegness, four days of events celebrating the region's cultural diversity from the 22nd to the 25th of July. 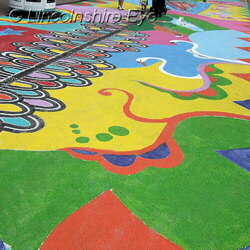 Free events included traffic art, pictured left, created by Ra Kajol with the help of local people and visitors. 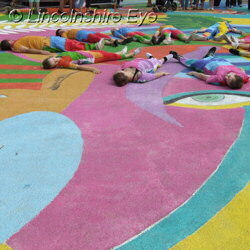 On the right, street performers blend in with the background of the colourful pavement art. 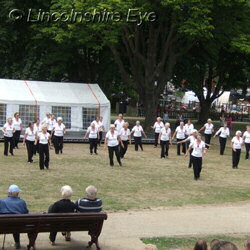 A number of dance groups performed at the Tower Gardens and other locations around the town. 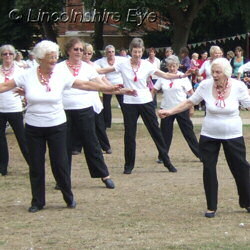 Janice Sutton Theatre School are shown on the left, dancing at Tower Gardens. On the right, three dancers from Made by Katie Green demonstrated their style of contemporary choreography. 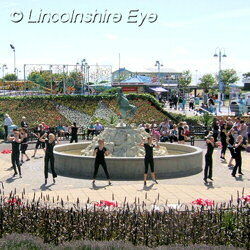 Skegness is one of the busiest resorts in Lincolnshire during the summer months.